RenovoGlass™ In the "restoration" glass category, Milano Glassworks has been working on a new product line. 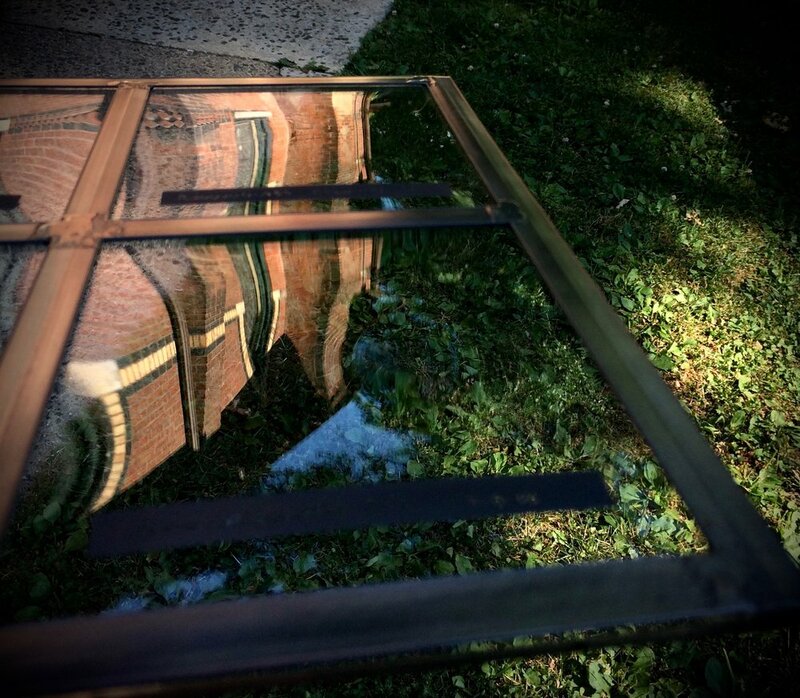 First introduced in 2017 and continually evolving, RenovoGlass™ offers several levels of distortions to simulate the characteristics of mouth blown, antique, historic and various other types of old window glass. Our patent pending process allows us to custom fabricate an extensive line of “restoration” glass products with characteristics unavailable from any other source. Working closely with historic glass models, from the early 1700's to the 1950's we are always striving to simulate the look and feel of historic glass. Now we can offer a variety of products to meet the modern demands of architects, builders and homeowners wanting the charm and nuance of old glass while offering the ability to have their glass in larger sizes and various thicknesses to allow tempering and insulated glass units to be manufactured. Please contact us to discuss your project to see if RenovoGlass™ is right for you! Made in the USA and available in 2.5mm, 3mm, and sizes up to 42" x 84”. What are "inclusions" in glass? Pictured above are examples of metal oxide inclusions surrounded by seeds in this antique mouth blown glass circa 1700. In a recent project I have been restoring windows dating back to 1704. This colonial farm house has been well preserved and the original structure has most of its original glass. It offered a great opportunity to examine and document historic glass from this period in the Mid-Atlantic region of the United States. The majority of the glass is true "single strength" mouth blown antique glass. While we rarely use single strength or less than 1/8" glass in our windows today this historic glass has an average thickness of .055" - .08", (1.4 - 1.8 mm), which is nominally 1/16" or slightly less. By any modern standards this if very thin glass and challenging to work on. Modern residential window glass which is typically called "double strength", (1/8" with a decimal equivalent of .125", or 3.17mm referred to generally as 3mm glass, is standard and thicker glass is often used in larger applications, for insulated glass units, security or sound dampening situations. Once I got all the glass out of the sash and carefully cleaned it there were an astonishing number of variations in each piece. It has a totally unique charm and authenticity that while challenging to work on was very satisfying. (as I stated in a previous post, I am a glass geek) One of the more interesting characteristics along with the "seeds" or air bubbles, striations or "straw marks" there were also a wide variety of "inclusions" and reamy marks. So what are "inclusions"? Inclusions in glass can be any number of foreign material that have become trapped in the glass. They vary from unmelted "batch" or the raw materials of soda-lime or quartz sand that stays in its solid state and did not properly melt into liquid glass, (typically white in appearance) and other imperfections that can be metal oxides and debris trapped beneath the surface of the glass, (more often appearing as dark brown or black specs). Working to recapture these characteristics in RenovoGlass™ is an ongoing process to make a truly authentic restoration glass with the nuance of hand blown glass and bringing it up to date to meet modern building requirements. We will be updating our process to include RenovoGlass™ Plus to incorporate "inclusions" in our upcoming product line. I'll talk more about RenovoGlass™ and the different "schedules" of glass that distinguish the various levels of distortion and "imperfections" in upcoming articles. Jim Flanagan of Fremont Antique Glass blowing antique glass. When it comes to "antique" or "restoration" glasses in the United States, the one that has the largest footprint is cylinder blown glass. It can be referred to as antique blown glass, mouth blown glass, hand blown glass, but they are all describing the same historic process of glass manufacturing. This process of window glass manufacturing became prevalent in the 1800's and continues in limited production today. In this type of glass the process is to draw or gather molten glass out of the glass furnace and form a molten blob of glass on the end of a blow pipe. Through a gradual process of adding air the bubble and reheating, turning and swinging the molten glass a cylindrical bubble is formed. During this phase different surface characteristics are introduced to the glass. These surface distortions can be in the form of various sized bubbles or "seeds" in the glass, striations or straw marks and other degrees of surface textures. Once the desired size and texture is achieved the glass is removed from the blow pipe and a glass cylinder or muff is then put into an oven for annealing, a process of gradual cooling. After the cylinder has cooled it can then have the ends removed leaving a glass cylinder. This cylinder is then scored and a fracture is achieved in the glass along the length of the cylinder. The glass cylinder is now ready for flattening into sheet glass. Once again the glass will be placed into an oven and heated to approximately 1,250º F. At this temperature the glass will once again be in a pliable state and can be flattened into a sheet form. The newly formed sheet will then be removed from the oven and placed into an annealing kiln again for gradual cooling. 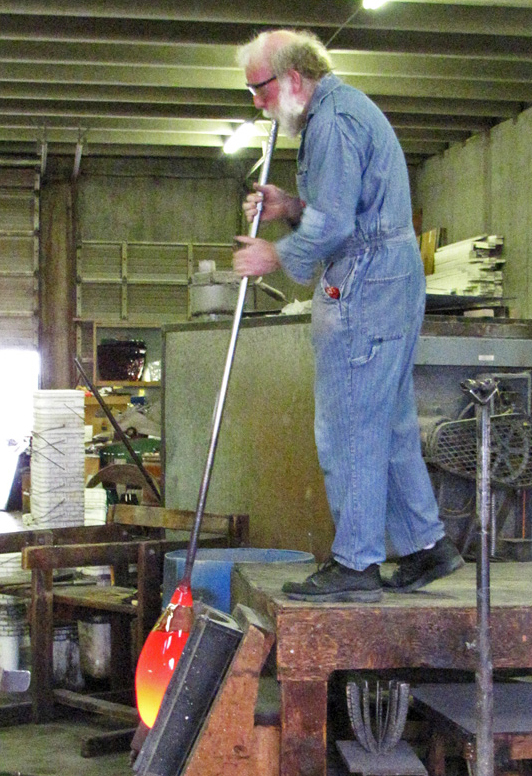 There are only two glass manufactures making mouth blown window glass in the U.S. today. Fremont Antique Glass in Washington state and Blenko Glass in West Virginia. In this illustration you can see a craftsman making crown glass or "bullion" glass. This was one of the earliest forms of window glass and many will be familiar with images of diamond quarry and rondel windows utilizing many small pieces of glass leaded into window. One of the characteristics of this glass is the appearance of concentric striations produced while the molten glass is being spun into shape. Crown glass was an early type of window glass and can be seen in medieval windows and is a traditional glazing that is still in limited use today. In this process, glass was blown into a "crown" or hollow globe. It would then be flattened by reheating and spinning out the bowl-shaped piece of glass (bullion) into a flat disk by centrifugal force, of various diameter. The glass was then cut to the size required. The thinnest glass was in a band at the edge of the disk, with the glass becoming thicker toward the center. Sometimes referred to as bullseye glass, the thicker center area around the punty mark was used for less expensive windows. In order to fill large window spaces with the best glass, many small diamond, or quarry shapes would be cut from the edge of the disk and these would be assemble with lead came and fitted into the window frame. Crown glass was one of the two most common processes for making window glass until the 19th century. In the United States you might find examples of this type of glass in the earliest colonial buildings but generally it is a less common form of glazing. The more prevalent would be the mouth blown cylinder glass which I will discuss in my next entry. Early Glass manufacturing, crown and blown glass. In the almost 30 years I've been doing stained and leaded glass in the greater Philadelphia area, it's hard to think of a time when restoration was not a subject of interest. Having worked on so many historic project and having spent over 20 years working with the many various glasses associated with the restoration field, I thought I'd take a few minutes to explain some of the important insights of this illusive material. Glass has been in use for about 4,500 years. It is one of the most fragile and enduring materials that man has ever made. So right there you have an apparent contradiction, how can glass be so versatile and enduring while being so seemingly fragile. Lets dig into it... first you should know, I love glass, and yes, I am a "glass geek". I can talk about glass till most peoples eyes glaze over and their ears begin to bleed. Technically speaking glass is an amorphous solid, unlike other solids it has it's own unique place in the physical world. This unique state makes it possible for simple sand, or silica (silicon dioxide, or SiO2), usually in the form of quartz to be transformed into a variety of materials from window glass to fiber optical strands. It can be both brittle and incredibly pliable, transparent or opaque and anywhere in-between. For this entry, let's focus on common window glass. A typical residential window will conform to these basic characteristics. It is transparent, or nearly transparent, generally clear or "colorless", it is waterproof and ranges in thickness from 3/32" to 1/4". There are of course exceptions, but this is the norm and accounts for 95% of the market. Historical overview: Over time there have been many different methods used to manufacture window glass. Some of the earliest production was crown glass, followed by blown glass then cast glass, cylinder drawn glass, fourcault or vertically drawn glass and then float glass which is the primary process used in modern architectural glass manufacture. In each of these various methods there are subtle and distinct characteristics embedded into the glass ranging from a variety of surface distortions and imperfections to almost flawlessly flat glass. Depending on the period and specifics of your restoration glass project finding the right glass to match is the key to a successful restoration. Stay tuned... more to come. Or feel free to contact me, joseph@milanoglassworks.com for more information about your specific project. I just finished spending some time with a beautiful grape motif, pink flashed glass vase by Steuben Glass. After installing a new window for a client, a pair of these beauties caught my eye. One of the pair had been damaged years prior. After contacting Steuben and several others who said they could not repair it, she thought I might be able to help. Always glad to spend some time with a beautiful piece of glass, I was happy to help out. The foot was broken but the client had wisely saved the missing pieces. Here is the patient on my operating table getting prepped. After a careful cleaning, the fun begins. Aligning the glass pieces is critical to minimize the interruption of light transmission, which is what makes the break visible. Choosing the best optically clear adhesive with the closest index of refraction helps too! Cleaning the broken edges, prep for glass bonding. Repaired vase detail of foot. The final result was pretty much what I expected. Nearly invisible, there were a very small chips along the fracture and the glass had "sprung" slightly, which means the glass had some stress in if from the manufacturing process. When glass is not annealed properly it has tension in it and when something causes the tension to be released such as setting this piece down too hard or in other cases adding hot or cold liquids, can cause a stress break which has different characteristics than an impact break. It was fun to examine this up close and spend time admiring the craftsmanship! And now it's stable and proudly back on display next to it's sister, above the mantle. The flowers are blooming and spring is in the air! I'm always inspired by nature as I watch new growth come after the dark days of winter. So I've been out with the camera taking photos for a planned new series of artwork. With so many choices for subjects coming into bloom each week, I thought it would be good to ask... what are your favorites? Magnolias and Iris typically top my list, but I love a lot of others too. Please weigh in, especially you women! Whether you got dirt under your fingernails from digging in the garden or just admire them from afar, let's hear your opinion. For those in the Media, PA area, I've been doing some spring cleaning too. I dusted off some stained glass windows and have put them in Past Life Designs, store in Media. Aimee Kosta has opened her new shop, an eclectic emporium of items for all kinds of interests! I'll be adding more in the upcoming months and who knows, your flower suggestions might just be on display, so let me hear your thoughts and stop in on Aimee when you are out and about in Media! We all develop routines, some we are not even fully aware of, that is until something changes. For me that day came when I was not awoken by my faithful companion of nearly 11 years, Sadie. “Sadiebaby” was not a perfect dog, she had many quirks, but so do I. Somehow we developed a symbiotic relationship. Each of us had our part, she needed me and I needed her. We gave each other purpose, she made me smile on those bad days, comforted me on those hard days and never left my side. She shared in those amazing days too, beautiful walks or just sitting together and not speaking a word, just being. I could count on her like no other. Like my shadow she was just there, quietly in the background of my life. Always nearby when an excuse was needed to distract yourself and get lost in the greatness of unconditional love with a truly loyal friend. I hope everyone has experienced such a wonderful relationship. And yes it’s very hard when you lose your best friend. When all those routines get thrown out of place and your compass in life loses its north pole gently guiding you through the day. It’s been the longest day since she passed. There is an unsettling quiet in the house. All those un-noticed routines are all now screaming silence full of emptiness. Still I don’t have a single regret. I’d do it all again in a second. None of our friends are perfect. We are all flawed in one way or another. I’m so thankful to have had a partner who understood my flaws and accepted me for who I am, loved me no matter what I did or said. I’m truly grateful to have all those memories, bringing smiles to my face, making me laugh even years later. And today as I sit sobbing like a child, I would not give that up either, for they are tears of joy. The joy you can only know when you’ve experienced what it is to have such a great and loving friend. Her memory will be the glue that holds this old broken heart together and gives me comfort even now. Raise a glass with me, to Sadie! She will live forever in my heart and soul. A man’s best friend, my beloved dog and faithful companion, Sadie. I don't know if you are an angel, have an angel in your family or close circle of friends, but no one who was nearby and available leapt to mind. If you think you are my next angel or know where "she", (in this case) may live, give me a shout. In the mean time, back to the blank page... yes, long pause. All too often it's getting that first idea down on paper that presents the biggest challenge. Case study; I am working on a commission for a church and the subject is two kneeling angels. I looked around my studio, and no angels were to be found. Waiting on angels to appear and pose for inspiration, can be tricky and time consuming. As usual, this is going to take work and research is going to be required. I started with my reference files, did some image searches on Google and pulled a fresh pair of goose wings out for a photo shoot. Thanks to my hunting friend Tim for that contribution, I owe you one! Round one, wings, because I have them. A photo shoot, some photoshop and the inspiration begins to take shape. Canada goose wings are a great start for my angel. Kneeling angel will have to wait, but here is a place holder from my reference files. The actual composition will have an angel holding a candle and I'm thinking on one knee, but this gets me ready to find a model and set up another photo shoot and work out all the anatomy. And here is the rough concept of my kneeling angel. I'll post again when I'm farther along so stay tuned for... the rest of the story! Here is a quick look at the glazing process in a traditional stained glass window. Traditional materials and tools that have been used since medieval times in this ancient art. While Leonardo's Last Supper is the most iconic, Juan de Juanes version made a better composition for my square format, three lancet window. I re-enacted each character to get the anatomy correct and make the changes necessary to fit each figure into this window. Here is a detail of a widow for my SCUBA friends! Part of a large three lancet window I did not long after a dive trip to Bonaire. Loggerhead Turtle, painted stained glass. Love is Our Mission was the theme for the World Meeting of Families, which took place here in Philadelphia this past September. I had to wait till after the event to pour through hundreds of images of Pope Francis to get all the specific details for this design. I chose to pose him in front of the Cathedral Basilica of St. Peter and St. Paul. The composition had many objectives, it had to balance with the Divine Mercy medallion right next to it, and tie to the St. Thérèse and St. Louis and Zélie Martin medallions I did in another set of narthex doors. More on them in another post. Milano-Ti™ titanium etched glass medallion of Pope Francis Cathedral Basilica of Saints Peter and Paul. In the final stage of etching the Pope Francis medallion. Plenty of detail in John Notman's Roman-Corinthian architecture and all the detail in the Papal vestments. It takes a delicate touch to keep that detail, I can assure you. Just in time for Christmas and the beginning of the Jubilee Year of Mercy... I installed one of my new etched glass, laminated doors with an original medallion of Divine Mercy at Annunciation BVM Church in Havertown, PA. The composition includes St. Peters Basilica in the background and my original version of St. Faustina's vision of Divine Mercy. It's one of a pair of doors and medallions the other being Pope Francis from his visit to Philadelphia which I'll share next. Finished Divine Mercy medallion "Be merciful even as your Father is merciful", executed in Milano-Ti™, titanium etched glass. I'm just getting started on etching here, but it gives you the scale I'm working at. All that great Renaissance architecture, Bramante, Michelangelo, and Bernini gave me loads of details to spend many hours with! Thanks for visiting! We are working on adding new content to the site.